The only British player to make the second week of the French Open might be unknown to most, but he has already tasted victory on Wimbledon's Centre Court. Dominic Inglot is through to the last 16 of the men's doubles with Treat Huey of the Philippines, and the Briton is currently at a career-high doubles ranking of 37. French pair Michael Llodra and Nicolas Mahut stand in their way on Monday. But the 27-year-old's circuitous route to this point makes for an entertaining tale, not least his dabble with Hollywood. Inglot landed the role of double to actor Paul Bettany in the 2004 film 'Wimbledon', a dream for a self-professed "massive movie fan", and one that earned the then teenager £10,000. Asked to describe Bettany's tennis skills, a polite "sketchy" is the verdict, while the American lead had her own issues with hand-eye co-ordination. "I remember one scene with Kirsten Dunst where the ball boy throws her the ball off the ground and she has to catch it," says Inglot. "It took her 20 takes to catch the ball! "She was just not getting it done, and we were on the scene after that. I'm sitting there thinking, 'Someone, I don't know how, but get her to catch this ball!'" Inglot had his own off-camera duel with the double of Bettany's on-screen rival, Austin Nichols, losing repeatedly to the older player when filling time between scenes. However, once the cameras rolled, the Briton gained his revenge. "It was the one set I won against him and it was on Centre Court. I was like, 'Yes! This is the greatest thing ever!' It was a great experience." Buoyed by his brush with fame, the Londoner, who speaks fluent Polish thanks to his parents, set off in pursuit of glory of his own on the tennis circuit. "It's definitely not been an easy ride," he said. "I remember when I was playing Futures tennis, when I was 17 or 18, and I had this hope I was going to be a top guy, nothing was going to stop me. "That's where I met Treat and it was a good platform." Inglot got within sight of the doubles top 100 by 2010, but when a three-month lay-off for an ankle injury became nine months after a knee problem was discovered, he got a taste of another side of life with a work placement in the City. "I was sitting there in the office thinking I'd really like to be on the court right now," he says. "[The injury] might have been career-ending and maybe, if I didn't have the support of the LTA, I wouldn't have been able to afford all those surgeries, so I'm lucky to be in that position and I've got to make use of it." While Britain struggles to find any man able to even qualify for the tournaments that number one singles player Andy Murray competes in, the doubles scene is in healthier shape. At a time when the governing body is gearing up for its annual fortnight in the media spotlight during Wimbledon, Inglot pays tribute to the LTA and the work of doubles coach Louis Cayer. "Whatever I can get, I'm absolutely grateful for," said Inglot. "I never expected anything. "I think some of the players think, 'I'm this, I'm that', and they expect something, and that's not the way of looking at it. [The LTA] are not there to facilitate - if you can get any help, that's fantastic, and they have been great with me. "They helped with the surgery on the ankle and then on the knee, and they said 'If there are any other issues, unfortunately we can't support you,' because that's a huge amount they spent on me. "And I'm a doubles player, I'm not Andy Murray in singles, but they've always been honest and you can work around that. "I know some players haven't had that support but the LTA have always been good to me." Inglot describes playing tennis for a living as "the ultimate dream", adding: "When I was a little kid I remember cutting the cake on my birthday and blowing the candles out and saying 'I want to be a professional tennis player'. "Whatever comes with that is just the icing on the cake. If I get [the attention], that's fantastic; if I don't, there's a lot of other guys that deserve it." 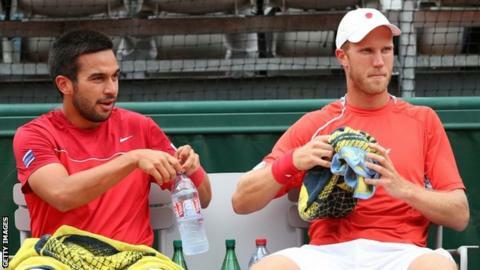 For now, Inglot and Huey have the opportunity to reach a first Grand Slam quarter-final when they take on France's Michael Llodra and Nicolas Mahut at Roland Garros. Some huge serving can be expected from the 6ft 5in Briton, although he admits the pair are still working on a catchy nickname. "I thought I really like 'Dom The Bomb' and then I started with Treat [pronounced Tret], and we were thinking 'Treat the Threat'. "So then we're thinking 'Bomb Threat', this is great, this sounds awesome! "But now in emails I think if I start writing 'Bomb Threat' too many times I might have them looked at. 'Bomb Threat on Court Six for practice,' and suddenly police are all over the place!"